The sculpture is a meticulous art that reappears to the Renaissance (15è, 16è century). - the low-relief, sculpted shape dug more or less, one speaks then of high-relief. - the frieze, surface hovers decorated forming a continuous strip above of doors and the windows. - medallions and emblems, plated on facades, they bring their circular rhythms that can be repeated several times. They represent the sculpted characters, of initials, of numbers. The porch of style Renaissance entrance was constructed under Napoléon III to the 19è century. It is composed of three arks decorated of richly sculpted pilasters. Navarre, future Henri IV of France. H for Henri II of Navarre, grandfather of the future king. A frieze represents the interlocking foliages as well as characters. 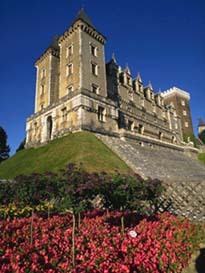 To the Renaissance, the castle was transformed. The dungeon of Gaston Febus was constructed by Sicard of Lordat to the XIV century on order of Febus. It is comparable to towers of the castle of Morlanne and the castle of Montaner (castles fébusiens). It allowed lookouts to supervise the horizon thanks to its height. It is pierced of four windows, constructs in stones but especially in bricks and mortar. 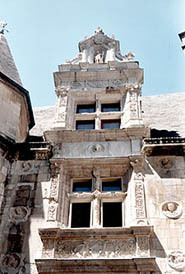 The blazon is affixed on the porch that joins the dungeon to the central building. It carries the mention " Febus me fe " : Febus made me (to construct). To the Italian Renaissance, one sees to reappear gardens of approval bus to the Middle Ages one preferred the utilitarian gardens. It is to the only time of Henri II of Navarre, grandfather of the future Henri IV whom gardens of approval are creates around the castle of Pau. To reach gardens of the castle, it is necessary to get round the wing of the South of France, to take down some marches, to pass under an arbor where shoot of the grapevine, to finally clear on the terrace. Gardens are shape breve, surrounded of enclosures in wood. To the center, 18 small floors are regrouped and are delimited by the built boxtrees. Defensive walls are walls of stone that defend the castle. Three pregnant surrounded the castle of Pau. We never knew if they were useful because there was no attack. To the XV century, two pregnant were destroyed ; defensive walls disappeared to the Renaissance because kings preferred palaces then that the strong castles. The poterne is a hidden door, breakthrough in the defensive wall of a fortification and often giving on the ditch. It is often bristled of picks, difficult to drive. Sometimes a dug inside trap, reinforce the security. In short, the poterne as well as all defensive elements are constructed well, enemies can renounce. 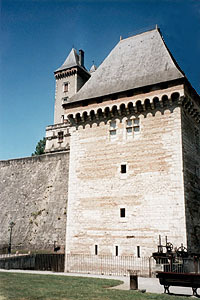 The tower of the currency was a defensive, freestanding tower, placed to the south of the castle and served to watch crams it of Pau, the Pyrenees and Spain. 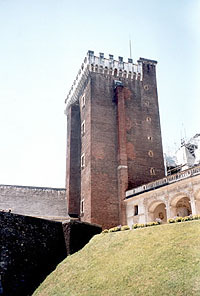 To the origin, this tower was called the Tower of the Mill.